Get started with journaling with these simple tips for writing your first journal entries. So you want to start journaling but you aren’t sure how to start or what to write. You tell yourself your life is too boring or that you aren’t a good writer. You’ve tried to write in a journal before but it never really worked out because you wrote a few days and then gave up. Isn’t it interesting how we put so many requirements on something that is supposed to be enjoyable and helpful? I know this sounds really simple, but I want to acknowledge how hard it is to put the first mark in a brand new notebook. So this first tip is to just start. Just write something. It could even be your name. Once you get past the fear of messing up on your journal it becomes way easier to continue. Set a timer or a page number goal and write whatever comes to your mind without censoring. I found the best way to do this is by using morning pages as described in this book. I found morning pages to be a great place to start because you write without necessarily worrying about what to write about. Heck, when I was doing this I often just wrote about how my pen wrote and whether I liked my ink. Boring to read in the future? Maybe. But that wasn’t the point. The point was get started in a journaling practice. Often on busy days or when I lack energy to write much, I write just a few words to sum up my day. This could literally be just words, or it could be short sentences or phrases to remember something. Profound? Nope, but I remember doing those things when I read that. Another way to do this is to write out a timeline of day and try to remember what you were doing that day. This type of journaling could be long or short depending on the day. The point is to sum up your day. I find it helps me to mindfully reflect on what happened that day. Sometimes there just aren’t words. The good thing is your journal doesn’t need to be just words. You can draw, paint, paste in pictures, use stickers, or really anything you’d like. You could take a pen and scribble on a bad day and just get your feelings out. I find it rewarding to look back on prior journal pages and these can be lots of fun. Journal prompts are typically questions for you to answer in writing. I like these for when you aren’t sure what to write about because all you have to do is answer a question. Check out my blog post on journal prompts for mental health for some examples of journal prompts you can use. There are also several books for journal prompts. Another way to get started with journal prompts is to use a guided journal like the one I recommend here. Using a guided journal will help you get into the habit of journaling. In this journal you answer several questions each morning and night. It doesn’t take up a lot of time but helps you to learn how to reflect on things that matter. I’ve just discovered the idea of a 5 Year Journal and started to use this one recently. Five years sounds a bit overwhelming but I recommend this journal for beginners because it gives you about an inch to write on each day, which is very doable. For the same reason, you could look at buying a smaller journal such as one in an A6 or B6 size. The way my five year journal works is that each day there is about an inch of writing for each year, so imagine a page that is divided into five sections. The top section is for this year and the next one is for next year and on and on. I think this is a pretty cool idea. I look forward to getting to next year since I am in my first year on this journal. I also do journal prompts in this journal and am currently using this book for inspiration. I look forward to seeing how my answers change from year to year. A popular choice is to write a gratitude journal. Each day you reflect on things you’re grateful for. These really shouldn’t just be huge things. Instead, you want to focus on all the little things you’re grateful for. This helps you direct your mind toward the positives in each day. Since you know you will need to come up with some things you’re grateful for, you’re more likely to notice those things. I really like this guided gratitude journal because it is pretty. You could also use your journal for things like lists. Today I saw on Facebook that someone was using her journal just for tracking television shows and movies she was watching. The sky is the limit. So there you have it! 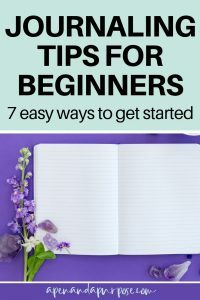 I hope these seven ideas for beginning journaling will help you get started. I suggest starting with one, trying it for a while and getting into the practice. Pick the one you feel will be easiest for you to stick with or the one that is easiest to start. I started with the morning pages because that is what I needed at the times since I was feeling like I was creatively blocked. For more ideas about how to keep journaling consistently once you start, I recommend reading this article on tips to write in your journal daily.